Inactive ingredients: Calcium phosphate dibasic anhydrous, microcrystalline cellulose, colloidal silicon dioxide, magnesium stearate, sodium starch glycolate, sucrose, gum acacia, maize starch, talc, purified, iron oxide red, titanium dioxide. Acute musculoskeletal disorders and trauma such as periarthritis (especially frozen shoulder), tendinitis, tenosynovitis, bursitis, sprains, strains and dislocations; relief of pain in fractures. Control of pain and inflammation in orthopaedic, dental and other minor surgery. Pyrophosphate arthropathy and associated disorders. The short-term treatment of fever related to infections of the Ear, Nose and Throat (E.N.T. ), e.g. pharyngotonsillitis, otitis media. As monotherapy or as adjunct therapy with morphine or other opiates (due to its opiate-sparing effect) for the relief of acute post-operative pain. Undesirable effects may be minimized by using the lowest effective dose for the shortest duration necessary to control symptoms. (see Warnings and Precautions). The Recommended Daily Dose is: 100-150 mg in two or three divided doses. For milder cases, 75-100 mg daily in two or three divided doses, is usually sufficient. In migraine, an initial dose of 50 mg should be taken at the first signs of an impending attack. In cases where relief 2 hours after the first dose is not sufficient, a further dose of 50 mg may be taken. If needed, further doses of 50 mg may be taken at intervals of 4-6 hours, not exceeding a total dose of 200 mg per day. The Recommended Daily Dose is: 75-100 mg in two or three divided doses. They should be given up to 2 mg/kg body weight per day in 3 divided doses, depending on the severity of the disorder. The use of diclofenac potassium 25 mg and 50 mg tablets in migraine attacks has not been established in children. Vastaflam 50 mg Tablets are not recommended for children under 12 years old. Undesirable effects may be minimized by using the lowest effective dose for the shortest duration necessary to control symptoms. Hypersensitivity to diclofenac or to any of the excipients. NSAIDs are contraindicated in patients who have previously shown hypersensitivity reactions (e.g. asthma, rhinitis, angioedema, or urticaria) in response to ibuprofen, aspirin, or other non-steroidal anti-inflammatory drugs. Severe heart failure, hepatic failure and renal failure. (see Warnings and Precautions). History of gastrointestinal bleeding or perforation, relating to previous NSAID therapy. During the last trimester of pregnancy (see Pregnancy and Lactation). NSAIDs are contraindicated for treatment of peri-operative pain in the setting of coronary artery bypass graft (CABG) surgery. Undesirable effects may be minimized by using the lowest effective dose for the shortest duration necessary to control symptoms (see Dosage and Administration, and GI and Cardiovascular risks below). The use of diclofenac potassium with concomitant NSAIDs including cyclooxygenase-2 selective inhibitors should be avoided (see Drug Interactions). The elderly have increased frequency of adverse reactions to NSAIDs, especially gastrointestinal bleeding and perforation which may be fatal (see Dosage and Administration). Close medical surveillance is imperative in patients with symptoms indicative of gastrointestinal disorders, with a history suggestive of gastric or intestinal ulceration, with ulcerative colitis, or with Crohn's disease as these conditions may be exacerbated (see Undesirable Effects). GI bleeding, ulceration or perforation, which can be fatal, has been reported with all NSAIDs, at any time during treatment, with or without warning symptoms or a previous history of serious GI events. The risk of GI bleeding, ulceration or perforation is higher with increasing NSAlD doses, in patients with a history of ulcer, particularly if complicated with haemorrhage or perforation (see Contraindications), and in the elderly. These patients should commence treatment on the lowest dose available. Combination therapy with protective agents (e.g. misoprostol or proton pump inhibitors) should be considered for these patients, and also for patients requiring concomitant low dose aspirin, or other drugs likely to increase gastrointestinal risk (see below and Drug Interactions). Caution should be advised in patients receiving concomitant medications which increase the risk of ulceration or bleeding, such as oral corticosteroids, anticoagulants such as warfarin, selective serotonin-reuptake inhibitors or anti-platelet agents such as aspirin (see Drug Interactions). When GI bleeding or ulceration occurs in patients receiving Vastaflam, the treatment should be withdrawn. NSAlDs should be given with care to patients with a history of gastrointestinal disease (ulcerative colitis, Crohn's disease) as these conditions may be exacerbated (see Undesirable Effects). Close medical surveillance is imperative in patients suffering from severe impairment of hepatic function. As with other non-steroidal anti-inflammatory drugs, allergic reactions, including anaphylactic/anaphylactoid reactions, can occur without earlier exposure to the drug (see Undesirable Effects). Like other NSAIDs, Vastaflam tablets may mask the signs and symptoms of infection due to their pharmacodynamic properties. In patients with Systemic Lupus Erythematosus (SLE) and mixed connective tissue disorders, there may be an increased risk of aseptic meningitis (see Undesirable Effects). Vastaflam contains sucrose, so if you have intolerance to some sugar, you should contact the doctor before taking this product. This product contains potassium, so this must be taken in consideration when giving Vastaflam to patients with reduced kidney function or patients on controlled potassium diet. NSAIDs may cause an increased risk of serious cardiovascular thrombotic events, myocardial infarction (MI), and stroke, which can be fatal. This risk may increase with duration of use. Patients with cardiovascular disease or risk factors for cardiovascular disease may be at greater risk. NSAIDs are contraindicated for treatment of peri-operative pain in the setting of coronary artery bypass graft (CABG) surgery. NSAIDs cause an increased risk of serious gastrointestinal adverse events including bleeding, ulceration, and perforation of the stomach or intestines, which can be fatal. These events can occur at any time during use and without warning symptoms. Elderly patients are at greater risk for serious gastrointestinal (GI) events. The administration of an NSAlD may cause a dose-dependent reduction in prostaglandin formation and precipitate renal failure. Patients at greatest risk of this reaction are those with impaired renal function, cardiac impairment, liver dysfunction, those taking diuretics and the elderly. Renal function should be monitored in these patients (see Contraindications). If abnormal liver function tests persist or worsen, clinical signs or symptoms consistent with liver disease develop or if other manifestations occur (eosinophilia, rash), Vastaflam should be discontinued. Hepatitis may occur without prodromal symptoms. Use of Vastaflam in patients with hepatic porphyria may trigger an attack. Vastaflam may reversibly inhibit platelet aggregation (see Drug Interactions). Patients with defects of haemostasis, bleeding diathesis or haematological abnormalities should be carefully monitored. All patients who are receiving long-term treatment with non-steroidal, anti-inflammatory agents should be monitored as a precautionary measure e.g. renal function, hepatic function (elevation of liver enzymes may occur) and blood counts. This is particularly important in the elderly. Clinical trial and epidemiological data suggest that use of diclofenac, particularly at high dose (150 mg daily) and in long-term treatment may be associated with a small increased risk of arterial thrombotic events (for example myocardial infarction or stroke). Patients with significant risk factors for cardiovascular events (e.g. hypertension, hyperlipidaemia, diabetes mellitus, smoking) should only be treated with Vastaflam after careful consideration. Patients with uncontrolled hypertension, congestive heart failure, established ischaemic heart disease, peripheral arterial disease, and/or cerebrovascular disease should only be treated with Vastaflam after careful consideration. Similar consideration should be made before initiating longer-term treatment of patients with risk factors for cardiovascular events (e.g. hypertension, hyperlipidaemia, diabetes mellitus, and smoking). Serious skin reactions, some of them fatal, including exfoliative dermatitis, Stevens- Johnson syndrome, and toxic epidermal necrolysis, have been reported very rarely in association with the use of NSAlDs (see Undesirable effects). Patients appear to be at highest risk for these reactions early in the course of therapy: the onset of the reaction occurring in the majority of cases within the first month of treatment. Vastaflam should be discontinued at the first appearance of skin rash, mucosal lesions, or any other sign of hypersensitivity. The use of diclofenac potassium tablets may impair female fertility and is not recommended in women attempting to conceive. In women who may have difficulties conceiving or who are undergoing investigation of infertility, withdrawal of Vastaflam tablets should be considered. Other Analgesics including Cyclooxygenase-2 selective inhibitors: Avoid concomitant use of two or more NSAlDs (including aspirin) as this may increase the risk of adverse effects (see Warnings and Precautions). Cardiac glycosides: NSAlDs may exacerbate cardiac failure, reduce GFR and increase plasma glycoside levels. Ciclosporin: lncreased risk of nephrotoxicity. Mifepristone: NSAlDs should not be used for 8-12 days after mifepristone administration, as NSAlDs can reduce the effect of mifepristone. Anti-coagulants: NSAlDs may enhance the effects of anti-coagulants, such as warfarin (see Warnings and Precautions). Quinolone antibiotics: Animal data indicate that NSAlDs can increase the risk of convulsions associated with quinolone antibiotics. Patients taking NSAlDs and quinolones may have an increased risk of developing convulsions. Anti-platelet agents and Selective Serotonin Reuptake Inhibitors (SSRls): lncreased risk of gastrointestinal bleeding (see Warnings and Precautions). Tacrolimus: Possible increased risk of nephrotoxicity when NSAlDs are given with tacrolimus. Zidovudine: lncreased risk of haematological toxicity when NSAlDs are given with zidovudine. There is evidence of an increased risk of haemarthroses and haematoma in HIV(+) haemophiliacs receiving concurrent treatment with zidovudine and ibuprofen. Antidiabetic agents: Clinical studies have shown that diclofenac potassium tablets can be given together with oral antidiabetic agents without influencing their clinical effect. However there have been isolated reports of hypoglycaemic and hyperglycaemic effects which have required adjustment to the dosage of hypoglycaemic agents. Congenital abnormalities have been reported in association with NSAIDs administration in man; however, these are low in frequency and do not appear to follow any discernible pattern. In view of the known effects of NSAIDs on the fetal cardiovascular system (risk of closure of the ductus arteriosus), use in the last trimester of pregnancy is contraindicated. The onset of labour may be delayed and the duration increased with an increased bleeding tendency in both mother and child (see Contraindications). NSAIDs should not be used during the first two trimesters of pregnancy or labour unless the potential benefit to the patient outweighs the potential risk to fetus. In limited studies so far available, NSAlDs can appear in breast milk in very low concentrations. NSAIDs should, if possible, be avoided when breastfeeding. If serious side-effects occur, Vastaflam should be withdrawn. Clinical trial and epidemiological data consistently point towards an increased risk of arterial thrombotic events (for example myocardial infarction or stroke) associated with the use of diclofenac, particularly at high dose (150 mg daily) and in long-term treatment (see Contraindications and Warnings and Precautions). Gastrointestinal disorders: The most commonly-observed adverse events are gastrointestinal in nature. Peptic ulcers, perforation or GI bleeding, sometimes fatal, particularly in the elderly, may occur (see Warnings and Precautions). Nausea, vomiting, diarrhoea, flatulence, constipation, dyspepsia, abdominal pain, melaena, haematemesis, ulcerative stomatitis, exacerbation of colitis and Crohn's disease (see Warnings and Precautions) have been reported following administration. Less frequently, gastritis has been observed. Pancreatitis has been reported very rarely. (c) assorted skin disorders, including rashes of various types, pruritus, urticaria, purpura, angiodema and, more rarely, exfoliative and bullous dermatoses (including epidermal necrolysis and erythema multiforme). Renal disorders: Nephrotoxicity in various forms, including interstitial nephritis, nephritic syndrome and renal failure. Hepatic disorders: Abnormal liver function, hepatitis and jaundice. Neurological and Special senses disorders: Visual disturbances, optic neuritis, headaches, paraesthesia, reports of aseptic meningitis (especially in patients with existing autoimmune disorders, such as systemic lupus erythematosus, mixed connective tissue disease), with symptoms such as stiff neck, headache, nausea, vomiting, fever or disorientation (see Warnings and Precautions), depression, confusion, hallucinations, tinnitus, vertigo, dizziness, malaise, fatigue and drowsiness. Haematological disorders: Thrombocytopenia, neutropenia, agranulocytosis, aplastic anaemia and haemolytic anaemia. Dermatological disorders: Bullous reactions including Stevens Johnson Syndrome and Toxic Epidermal Necrolysis (very rare). Photosensitivity. Cardiovascular system disorders: In isolated cases, palpitations, chest pain, hypertension, congestive heart failure. Other Organ systems disorders: Impotence (very rare). These include headache, nausea, vomiting, epigastric pain, gastrointestinal bleeding, rarely diarrhoea, disorientation, excitation, coma, drowsiness, tinnitus, fainting, occasionally convulsions. In rare cases of significant poisoning acute renal failure and liver damage are possible. Renal and liver functions should be closely monitored. Pharmacotherapeutic group: Non-steroidal anti-inflammatory drug (NSAID). Vastaflam tablets contain the potassium salt of diclofenac, a non-steroidal compound with pronounced and clinically demonstrable analgesic, anti-inflammatory and anti-pyretic properties. Vastaflam is a potent inhibitor of prostaglandin biosynthesis and a modulator of arachidonic acid release and uptake. Vastaflam Tablets have a rapid onset of action and are therefore suitable for the treatment of acute episodes of pain and inflammation. In migraine attacks, diclofenac potassium tablets have been shown to be effective in relieving the headache and in improving the accompanying symptom of nausea. Diclofenac, in vitro, does not suppress proteoglycan biosynthesis in cartilage at concentrations equivalent to the concentrations reached in human beings. Absorption: Diclofenac is rapidly and completely absorbed from sugar-coated tablets. Food intake does not affect absorption. Peak plasma concentration after one 50 mg sugar-coated tablet was 3.9 μmol/l after 20-60 minutes. The plasma concentrations show a linear relationship to the size of the dose. Diclofenac undergoes first-pass metabolism and is extensively metabolised. Elimination: The total systemic clearance of diclofenac in plasma is 263 ± 56 ml/min (mean ± SD). The terminal half-life in plasma is 1-2 hours. Repeated oral administration of diclofenac potassium tablets for 8 days in daily doses of 50 mg t.d.s does not lead to accumulation of diclofenac in the plasma. Approximately 60% of the dose administered is excreted in the urine in the form of metabolites, and less than 1%, as unchanged substance. The remainder of the dose is eliminated as metabolites through the bile in the faeces. Biotransformation: The biotransformation of diclofenac involves partly glucuronidation of the intact molecule but mainly, single and multiple hydroxylation followed by glucuronidation. The age of the patient has no influence on the absorption, metabolism, or excretion of diclofenac. In patients suffering from renal impairment, no accumulation of the unchanged active substance can be inferred from the single-dose kinetics when applying the usual dosage schedule. At a creatinine clearance of < 10 ml/min, the theoretical steady-state plasma levels of metabolites are about four times higher than in normal subjects. However, the metabolites are ultimately cleared through the bile. In the presence of impaired hepatic function (chronic hepatitis, non-decompensated cirrhosis), the kinetics and metabolism are the same as for patients without liver disease. Vastaflam 25 mg Sugar-coated Tablets: Box containing 2 strips of 10 sugar-coated tablets each. 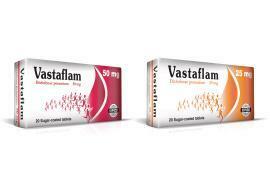 Vastaflam 50 mg SSugar-coated Tablets: Box containing 2 strips of 10 sugar-coated tablets each.